Over the years, I’ve had the opportunity to visit some patients outside the office and share a meal. I always consider it a real honor to be invited into someone’s home. Last weekend, Mrs. E and Mr. C, a married couple and dear patients of mine, invited me over to meet their grandchildren. The evening couldn’t have been more lovely, but I was surprised to hear some angst in the voice of Mrs. E as she apologized for serving red meat and potatoes. It didn’t occur to me that they might feel judged for their nutritional virtues, or perceived lack thereof, while they were hosting me. So, here’s a doctor’s take on eating meat and potatoes…its OK! The thing about weight management and eating for optimal health is that you can eat most things in moderation. Just balance your plate with the right proportion of meat vs. vegetables vs. carbs and you’ll be fine. Its not like they were serving Cheetos smothered with Velveeta sauce for dinner (does that even exist? ), followed by deep fried Twinkies for dessert. 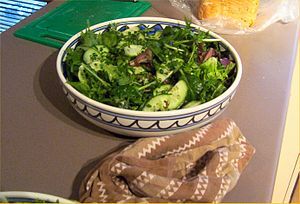 The table had an array of fresh and healthy vegetables, including a plate of crudites, composed of carrots, cucumbers and broccoli, as well as cooked eggplant and a big salad with tomatoes and onions. It was a delicious feast! Of note, we drank water with dinner, which fits with my “don’t drink your calories” approach to beverages. Here’s how I set up my plate. With Mrs. E’s permission, I sliced off a small portion of the lean red meat, taking less than half of the serving offered to me. Selecting an appropriately petite potato was no problem, as they were all a reasonable size. I put only the thinnest pat of butter on my potato and didn’t add any salt. My plate was brimming with salad and other vegetables, which served as the entree, while keeping the meat and potatoes in their proper places, as side dishes. I followed the ever practical advice to fill at least half my plate with produce, and was actually pleased with the healthy composition of my meal. I may not have red meat again for many months, probably not until another dinner party at the home of a friend. However, when I next have meat and potatoes, I will consider it a treat, knowing I can enjoy with impunity anything in moderation. Many thanks to Mrs. E and Mr. C. for a delightful and healthy meal. You submitted to an unexpected nutritional examination and passed with flying colors! Thanks for listening and I wish you (and Mrs. E & Mr. C) the very best of health!